I was up a little late this morning! I couldn’t believe it I must have shut the alarm clock off. I was up at 8 am. Ouch! Of course that is 7 am Texas time so I don’t feel so bad. I had my quiet time, ate my grapefruit and toast, walked 4 miles on the treadmill, showered, and dressed. I completed two chapters for two of my new books. I finished a chapter for a new book on FRIENDSHIP. I also finished a chapter for JUST A THOUGHT VI. Please visit www.solvechurchproblems.com and you will see our new books and also be able to take advantage of my sermons preached at the Longview Baptist Temple during my 29 years of pastoring there. God gave us over one million souls during that 29 year period. God allowed us to give 9.3 million dollars to missions. This is a great church and the services are exciting. I had lunch with Pastor Charles Webb today and I thoroughly enjoyed my time with him. He is doing an excellent job of pastoring Anderson Baptist Church of Anderson, Indiana. He gave me his car to drive to Pastor Terry Flynn’s church in Frankfort, Indiana, for a 7 pm service tonight. I preached the sermon tonight at Frankfort Baptist Temple “The Path To Successful Personal Soul Winning.” There was a great response to the sermon by the people. 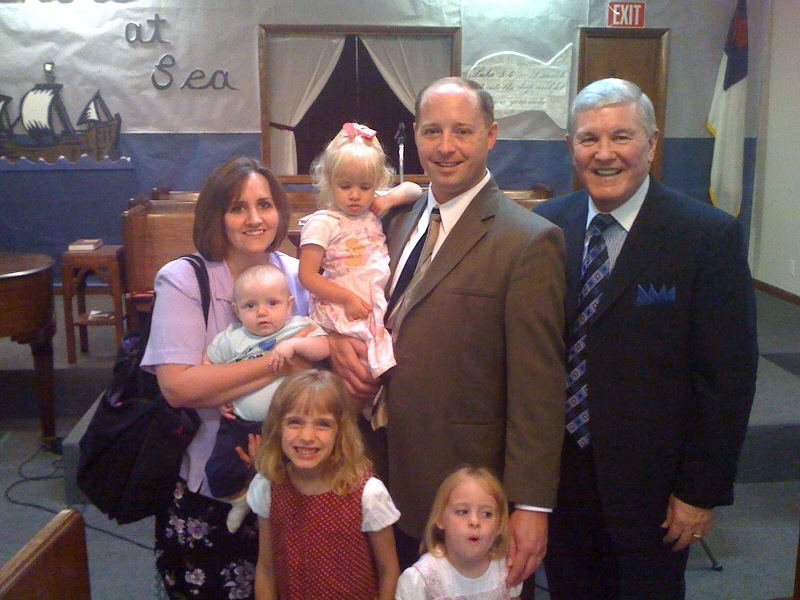 After the service I was able to have my picture taken with Pastor Flynn and his family. In the picture you have Malaya age 7, Lanora age 4, Anella age 2, and baby Mckinley 5 months old. Pastor Flynn graduated in 2003 from TEXAS BAPTIST COLLEGE and his wife Lacey graduated in 2002 from TBC. Pastor and Mrs. Flynn have been pastoring in Frankfort for just under a year and are doing a wonderful job of soul winning. 132 have been led to Christ so far this year! GOTTA LOVE SOUL WINNING! By the way you never have to worry about staff or faculty at TBC putting a question mark on the KJB. The KJB is the King James Bible in case you don’t know! Gotta love serving the Lord!